L'Ecurie is a lovingly restored barn that has been converted with all mod-cons, and yet still retains the simple charm of a mountain stone house. There are small steps leading through the gate up to the two pretty sun terraces. The front door leads into the terrace lobby.
. Bedroom one is a double with bathroom with bath and shower en suite.
. Bedroom two is also a double with a larger bathroom with bath and shower en suite.
. The kitchen/living room has stove, fridge/freezer, gas cooker and microwave. There is a CD player and DVD.
. Split level terrace, one with wood decking, barbecue and table and chairs, umbrella; the lower terrace is paved in slate and ideal for sunbeds. Many unusual features have been developed using the original manger rails and a rock feature in bedroom one.
. Parking is available immediately outside the property. Vira is less than an hour's drive from Perpignan: This charming and totally self contained gite is part of 'La Grange', a lovingly converted stone sheep bar in the foothills of the Pyrenees. It is situated in the Pyrenean village of Vira, one of the most picturesque villages in the area and offers lovely views over the surrounding valleys and forests. Forty miles west of Perpignan, Vira is totally unspoilt and is on the edge of the Foret de Boucheville. The small village has a plan d'eau and barbecue area, a delightful church and a marie, where the local mayor and staff are happy to provide all the information visitors require about the many delights of the area. La Grange hugs the side of the mountain and is situated on the edge of the village. Unspoilt tracks through the adjoining forest and hills are on the doorstep. The local area: Vira is an ideal location for country lovers looking for activities such as walking, riding, cycling on the numerous well-marked trails. It is also perfect for those who just want to relax in the sun and enjoy the wonderful wildlife. All around is unspoiled landscape, vineyards, hills, forests, valleys, mountains, rivers, gorges and waterfalls. In early spring and summer the almond and cherry blossom, wild flowers, herbs, butterflies and bird life are a never-to-be-forgotten experience. The area enjoys some of the driest and warmest weather in France with blue skies most of the year round. Summer temperatures of around 30 degrees are common with the cool mountain breeze at night being a welcome benefit. The neighbouring village of Fosse has a free open air pool which is open during the months of July and August. The Mediterranean sea and long sandy beaches are only 40 miles away and the sea temperatures are warm enough to swim well into October. Nearby Attractions: The whole region remains very unspoilt, yet offers a wealth of things to do and see. There are stunning Cathar castles to explore, notably Peyreperteuse, Queribus and Puilrens. At Tautavel is a fascinating museum dedicated to pre-historic man and you can view the ongoing archaeological dig on giant screens. The area is famous for some fine examples of Roman architecture such as the aqueduct at Ansignan, the abbey at Serrabonne and the thermal baths at Rennes le Bains where you can bathe all year round. Perpignan the very Catalan capital of the region, is an hour's drive and the beautiful medieval walled city of Carcassonne 1 hour and 20 minutes. Just south of Perpignan is the quaint historic town of Ceret, home to many impressionist artists who are exhibited in the museum of modern art. Also for art lovers is the beautiful fishing village of Collioure, which inspired the paintings of Matisse, or the Dali museum at Figueres just across the Spanish border. Electric heaters in bedrooms and living room for use in winter months at extra cost. Plus heated towel rails in bathrooms. One set of bed linen is provided. There is parking outside the property. Occasionally it is in use by a local resident. If this is the case there is a car park in the village. 150 meters from the property. There is a large sofa and 2 large comfortable armchairs in the living room and a large coffee table. There are some board games including a chess board and boules provided. There are two pretty sun terraces. The upper terrace has table and 4 chairs and umbrella. 2 sun loungers are provided. There are tennis courts in the neighbouring villages of Fosse and Le Vivier. There is a free open-air swimming pool in the next village of Fosse, 5 minute drive, which is open in the afternoons during July and August. We consider pets if they are well behaved and are not allowed on the furniture. Excellent property. The house name would be useful on the front gate. The Gite was very clean and comfortable and we would certainly book it again if we were in the area. Thank you for your comments. We are delighted that you enjoyed your stay and we will be happy to welcome you back again if you return to this area. This charming, traditional house was just what we were looking for... you never quite know when you book! Situated in the peaceful and picturesque village of Vira with spectacular scenery all around, we thoroughly enjoyed our stay. There’s plenty to do and see as it’s a great location for walking, cycling, driving off the beaten track, and generally exploring. Other highlights included breakfast on the terrace, trips to the beach, and local wine tasting! The property was very clean and surprisingly cool in the summer heat. I would definitely recommend a rural holiday break here. I am so pleased that you enjoyed your stay at L'Ecurie. It means a lot to us that guests have a relaxing and comfortable experience. We hope to see you back in the future. 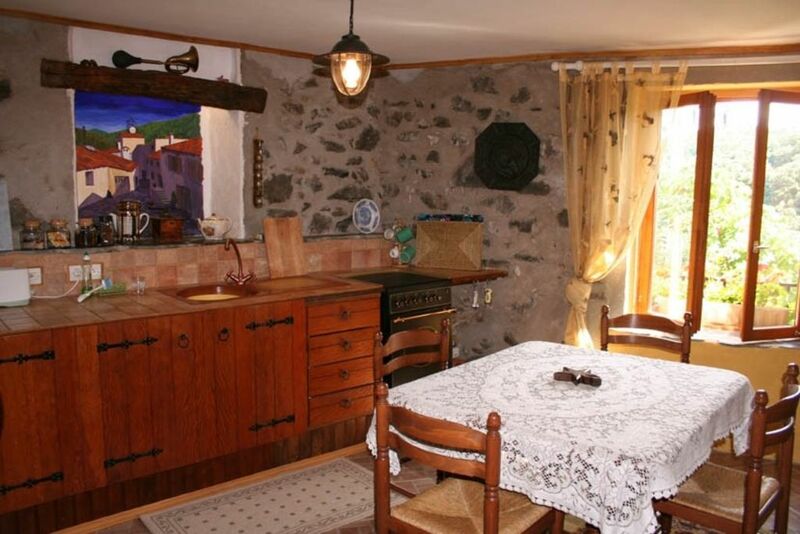 Gîte très agréable, propre, calme et bien décoré. Nous avons été enchantés de découvrir un rocher en forme de grotte dans notre chambre et l'éclairage qui va avec. A l'extérieur, il y avait beaucoup de papillons. Les gens du village étaient très polis. Vira compte une fontaine pour les grosses soifs de l'été et des sentiers de randonnée à proximité dont un avec de magnifiques gorges. Nous nous sentions en sécurité dans ce petit village de montagne. Je suis ravi que vous avez apprécié votre séjour à l'Ecurie et j'espère vous revoir bientôt. Nous avons passé 10 jours dans un cadre magnifique. Le gîte "l'écurie "est chaleureux et confortable. De part sa localisation, différents sites touristiques (châteaux cathars,...)et activités touristiques (randonnées, cannoying,...)sont à proximité. Point de départ idéal pour se ballader et découvrir cette très belle région. Le gite est très joli ainsi que le village. C'est une magnifique région à découvrir pour les amateurs de grands espaces,de nature et des Cathares. Il y a beaucoup de sites à visiter. Très heureuse de ces vacances ! Vira is a beautiful unspoilt village in the foothills of the Pyrenees and on the edge of the Foret de Bouchville. It is an ideal destination for holiday makers looking for peace and tranquillity. If you just want to walk and relax this is the perfect location. If sightseeing is your thing then the famous Gorge de Galamus is only a 25 minute drive away. Here you are in Cathar country and there are numerous Cathar castle to be explored including Queribus and Peryreperteuse. In nearby Tautavel there is a fascinating museum dedicated to pre-historic man. The area is famous for some fine examples of Roman architecture such as the aqueduct at Ansignan, the abbey at Serrabonne and the thermal baths at Rennes le Bains where you can bathe all year round. The next village of Fosse has a free open air pool open during the months of July and August and beautiful beaches are just over an hours drive away. If you fancy going further further afield you can be in Barcelona in just under 3 hours. Ski: There are several ski resorts within an hour and a half's drive, notably Font Romeu and Formigues. Further afield there is the famous ski resort at Andora. All ski resorts are suitable for all abilities and are very family friendly. All rates are based on 2 people staying using one bedroom. An additional charge will be made for 4 people. All rates include bed linen, towels, cleaning and heating, with the exception of low season when an extra charge will be made for heating.